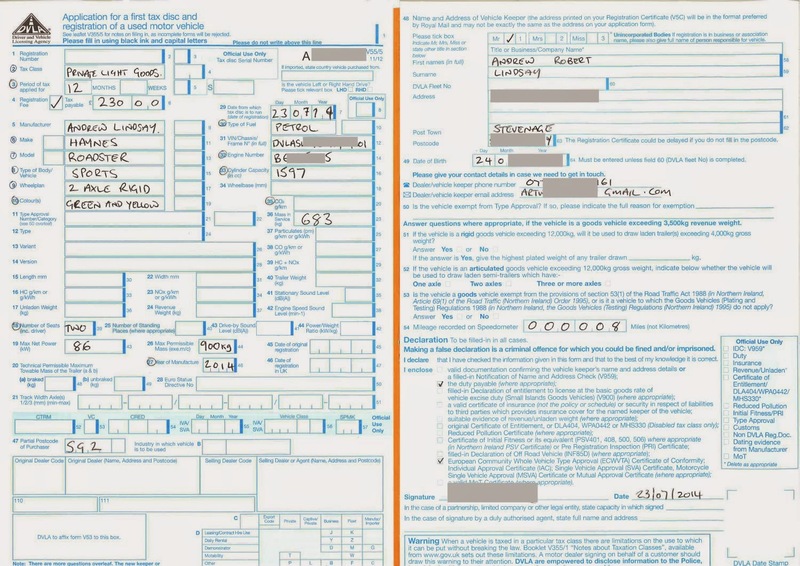 Forms for DVLA after IVA. As I scan pretty much anything important I send out, I thought my DVLA forms may be useful to some. I had no questions from DVLA about registering my vehicle and it was done in a little over 3 weeks. My registration was maybe slightly more complicated as I had them assign a private plate at the same time. So heres what I sent showing and how I filled them where applicable. 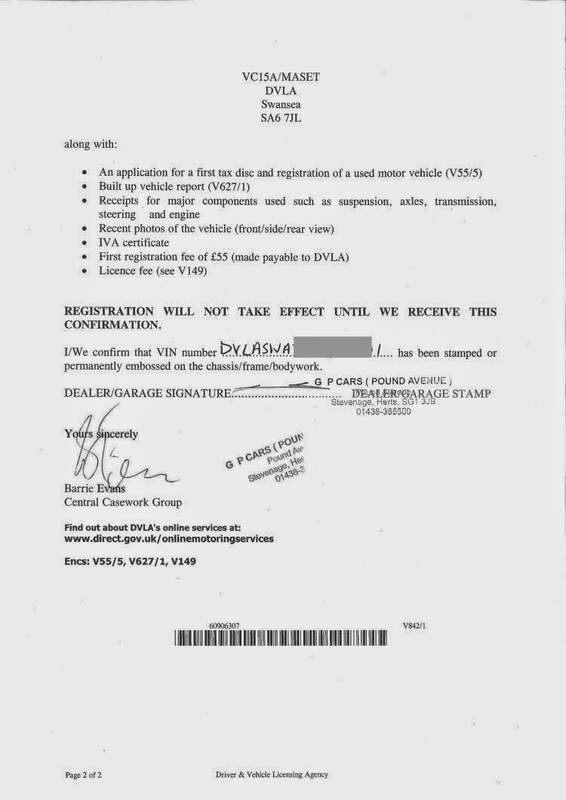 V55/5 - First registration form. V627/1 - Build up report. V842 - If you got a VIN from the DVLA, this needs to be stammped by a garage. Donor Chassis number and manufacturers plates that were cut from donor. Receipts for anything that appeared on the V627/1 build up report. Flat pack Chassis email recipt had the word NEW added before being printed. Photos of major build stages, about 20 in all start to finish. Cheque for £285 tax + fee. RMSD SAE for them to send my stuff back in. Last edited by Stot : 25th September 2014 at 08:11 PM. Today I start the forms! Thanks everyone. Just ordered my V55/5. Vehicle weights can anyone fill in the blanks? What have people put for type of body ?? Last edited by CTWV50 : 26th September 2014 at 09:51 AM. There are no blanks, If its not filled out above it doesnt need to be. 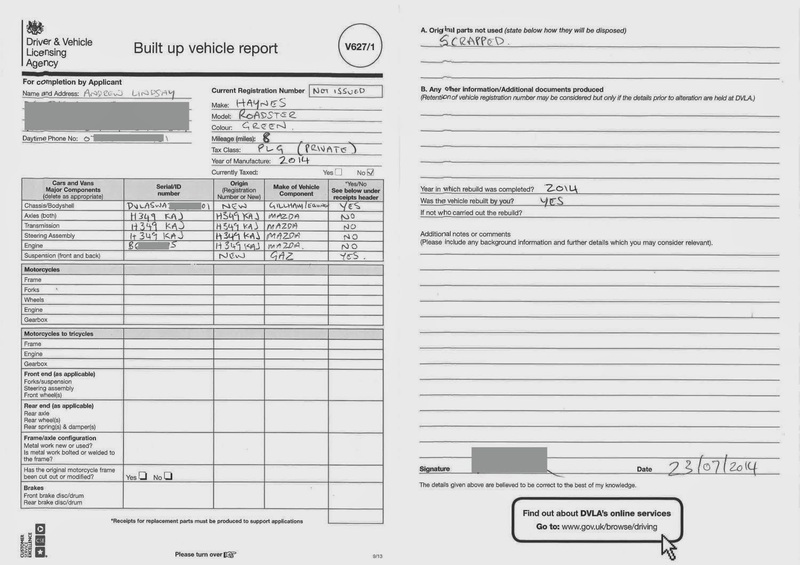 Everything there is exactly as it was sent to the DVLA and registered. Body type is 'Sports' as above. Oh wait do you mean the IVA application? Is the V627/1 just for accompanying the V55/5 application to show proof of build to stop people reregistering a previously registered or illegal vehicle of some sort? Sorry yes I've just edited my post sorry for the confusion. Put my IVA application up here. Its mainly to decide if you get a Q, age related or current new registration number. Oh well I know I'll be getting a Q plate anyway.